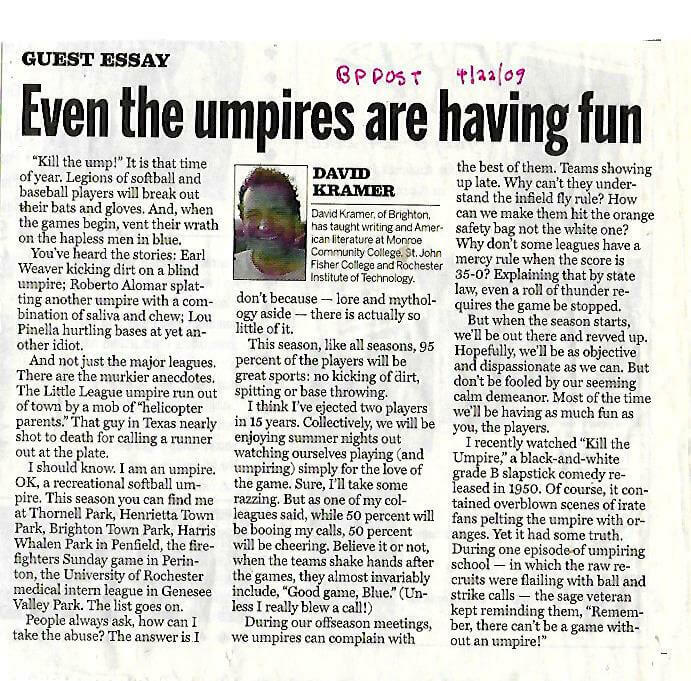 During the summer, I am a recreational softball umpire. Contrary to popular mythology umpires do not really get abused. Unless we make a really bad call. That I, myself, have not yet done in 15 years. 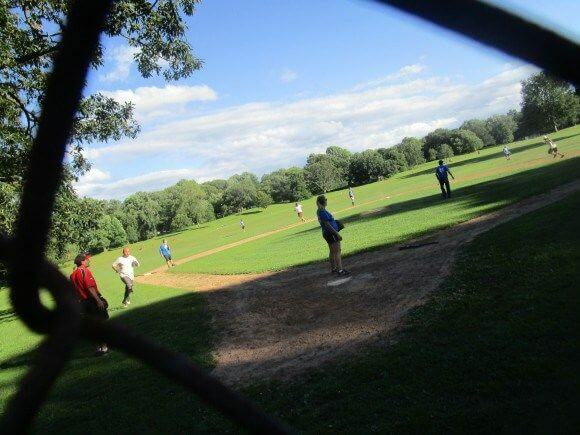 Almost all the time, along with the players, we relish summer evenings and weekend afternoons outside: Big Sky azure sunsets at Veteran’s Memorial Park in Henrietta, the electricity of urban ball under the lights at Cobb’s Hill, the diamond at Hamlin State Park Beach where Lake Ontario glints beyond center field. The barbecue after the Sunday Firemans game in Mendon. Perhaps my favorite venue is the University of Rochester Medical Center League (most players are affiliated with the Center) in Genesee Valley Park. The mood relaxed and good humored. The play can be spirited but always in good fun. A nice blend of socialization and softball. And on some Wednesdays were are entertained by a popular Drum Circle and a throng of dancing Hula Hoopers. With a certain light but distinctive aroma wafting over the field. As an umpire, one benefit of the League is the immediate medical attention I receive if suddenly injured. On Wednesday a stray foul ball careened into my unprotected (other parts were) chest. Thankfully, a team of trained medical personal rushed to my assistance. I survived my near death experience and was quickly back to calling balls and strikes. I also learned the League, which is run by the URMC Fitness and Wellness Center, is about more than softball. And people keep coming back. Patrick sees many of the same names on rosters each year, and even some of the same team names, like the X-Raiders. I think the same curmudgeonly Physics prof has been there for a decade still doubting the validity of my strike zone. And the games provide plenty of material for water cooler conversation. Even the occasional choice word directed at an umpire. Myself not included of course.